Hope this gives you some thoughts as to what you can do with your warmup and or conditioning portions of practice that utilize your full court transition and or press break systems. I have always felt that anytime you can involve handling the basketball. drilling your schemes, and competition in conditioning. Putting a time requirement to complete the drills is another way to make them competitive and hold players’ attention. I also like the idea of setting “standards of execution” for your warmup and conditioning drills requiring concentrating on a specific number of perfect passing and catching, layups, and all other areas of execution or requiring the players to repeat the drill. It stresses the importance of concentrating on every drill. 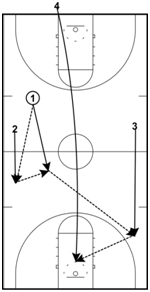 Two of the warm-up drills that I have done in the past to build a transition offense are Four-Man Break and Five-Man Break. These drills get your players to learn how to run the floor, are great conditioners early in practice, and place an emphasis on footwork and finishing with lay-ups in transition. Like Three-Man Weave, these two drills require the players to make a predetermined number of lay-ups or consecutive lay-ups without making a mistake. If a ball hits the floor for any reason, a player uses the incorrect hand in shooting a lay-up, a player travels, or a player runs the drill incorrectly, the lay-up does not count even on a made lay-up. 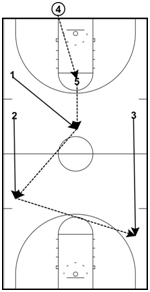 Four-Man Break requires a point guard, two wings, and a big. Any player can play any position in the drill. 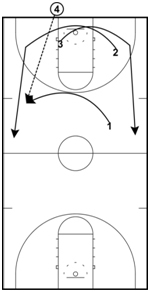 The wings (#’s 2 and 3) will start the drill in the corners, the point guard (#1) will start at the top of the key, and the big (#4) will start near the basket. 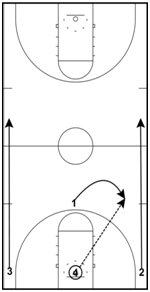 The drill begins as shown in Diagram 1 with #4 throwing the ball off of the backboard and grabbing the rebound. 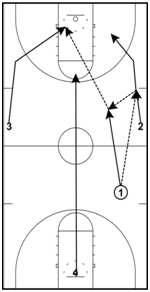 #1 will then get into a position to receive the outlet pass from him and look to pass up the floor. #1 will look to pass the ball up the floor to either wing. If, as Diagram 2 shows, the wing receiving the pass cannot score the lay-up, he will pass it back to #1 who will then pass to the opposite wing. If the wing with the ball can score the lay-up, he will shoot the ball. The sequence will begin again with #4 taking the ball out of the net, stepping out of bounds, and inbounding the ball to #1 (Diagram 3). We also want the wings to cross between the backboard and the baseline. We will go up and back twice with the big man who inbounded the basketball to start the last trip to score the lay-up to end the sequence (Diagram 4). As soon as we have made the required number of lay-ups to finish the drill, we will then move on to Five-Man Break. Five-Man Break requires a point guard, two wings, and two bigs. 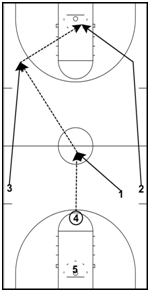 Like the four-man break drill, any player can play any position. There are notable differences between Four-Man break and Five-Man Break. The first of these is to whom the first big (#5) will pass the ball to once he collects the rebound. Instead of passing to #1 on the outlet, he will instead pass the ball to the other big (#4) to simulate a pressure release (Diagram 5). 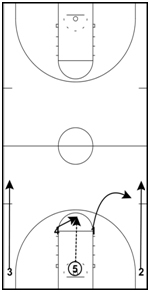 Once #4 receives the ball, #1 will cut to the middle of the floor and look for the pass from #4 before passing to the wing on the opposite side (Diagram 6). wing to touch the ball will score the lay-up if he can do so without traveling. The first big man down the floor will inbound the basketball on the trip back each time (Diagram 7). We will repeat the sequence with the wings changing sides of the floor by crossing between the backboard and the baseline. Also, we will have the bigs changing responsibilities based on who gets down the floor first. The first big down will take the ball out of the basket, step out of bounds, and inbound the ball to start the trip back. 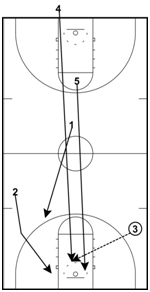 Any given sequence with Five-Man Break ends with the last big man down the floor on the second trip back scoring the last lay-up (Diagram 8). As soon as we have made the required number of lay-ups to finish the drill, we are done with Four- and Five-Man Break.